To move a seat forward or backward, raise the lever and slide the seat to the desired position and release the lever. To adjust the seat height, move the lever up or down. To change the seatback angle, lean forward slightly while raising the lever. Then lean back to the desired position and release the lever. Be careful when using the seat warmer: The heat from the seat warmer may be too hot for some people, as indicated below, and could cause a lowtemperature burn. Do not use the seat warmer with anything having high moistureretention ability such as a blanket or cushion on the seat: The seat may be heated excessively and cause a low-temperature burn. If the ignition is switched off while the seat warmer is operating (High, Mid or Low) and then switched ON again, the seat warmer will automatically operate at the temperature set before switching off the ignition. Use the seat warmer when the engine is running. Leaving the seat warmer on for long periods with the engine not running could cause the battery power to be depleted. 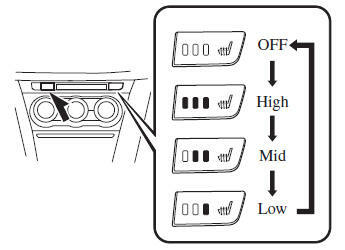 The temperature of the seat warmer cannot be adjusted beyond High, Mid and Low because the seat warmer is controlled by a thermostat.